Tue, Mar 26, 2019, 08:20 pm SL Time, ColomboPage News Desk, Sri Lanka. 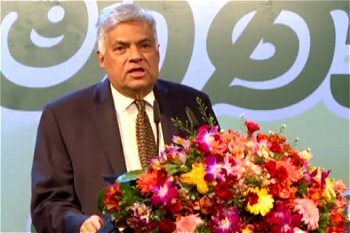 Mar 26, Colombo: Sri Lanka's Prime Minister Ranil Wickremesinghe says that the present government has served the largest role in the empowerment of women to lift them economically, politically, and socially. Addressing an awareness program for women entrepreneurs of Samurdhi families today, the Prime Minister said the government policy is to strengthen women giving them more opportunities to contribute to the family economy. The program 'Dhanabhimani Women Conference', organized by the Samurdhi Development Department with the assistance of Primary Industries and Social Empowerment Ministry was held at Temple Trees today under the patronage of the Prime Minister. Speaking further the Prime Minster said to fulfill government's policy to empower women, the government with many obstacles increased the women representation in politics to 25 percent. As a result women representation at local government institutions has increased tremendously and there are a number of women politicians today at grassroot level representing various political parties opening more doors for women's voice. The Premier said the budget this year has proposed that more women should be included in the director boards of private companies, especially the companies trading at the stock exchange. "The economy will not be developed without the contribution of women. Therefore, our policy is to take the country forward with the women. In our short time we will empower the women economically," the Prime Minister said. Minister Daya Gamage, State Minister Ali Sahir Moulana and Deputy Minister Anoma Gamage were also present on the occasion.